When a relationship ends, sometimes we can find ourselves lost. It may have been so long since we've been single that we have no idea how to be comfortable being alone or even who we are. We may feel that we have "lost ourselves" and have no idea what we need to do in order to find ourselves again. 1. Take yourself on dates. Want to go see the latest movie? Take yourself to the movie theater. Have a favorite restaurant you haven't been letting yourself go to by yourself? Just go! Want to spend some time at your favorite coffee shop? Take yourself. Yes, it can feel awkward going to these things by yourself at first, but the more you do it, then the more liberated you will feel. By doing the these things because you want to rather than because someone else is willing to go with you, you will not only get comfortable being alone, but you will also feel more free and empowered in your own life. 2. Go on a vacation alone. I seriously can't recommend this enough. When we go on vacation alone, two main things happen: A) We learn to really focus on ourselves and our own needs.So if you really don't feel like going to that one museum by the end of the day, so what?! The decision is all on you. And B) We learn to really get comfortable reaching out to other travelers or locals for help. Any shyness goes out the window quickly! As a result, we can find ourselves feeling so much more in control of our lives, more aware of ourselves (I mean, how can we not if we're not around someone else 24/7?) and more empowered by feeling like we can literally do and tackle anything! So, wherever it is that you want to go -- Europe, Asia, Mexico, Brazil or maybe even just the a few hundred miles away -- wherever it is, make plans and go do it! 3. Find things that you enjoy doing... then go do them! Did you used to love dancing, but you've stopped in the last few years? Start doing it again! Did you used to love keeping a garden or knitting? Then find time to do it! Reflect back on all the things that you used to enjoy doing in your life -- as a young kid, a teenager, even just a few years ago. Write all these things down on a list and make it a goal to start doing them again! 4. Do something you've always wanted to do, but haven't done. Is there anything you've always dreamed of doing, but you haven't give yourself the opportunity to do it? This could be learning how to paint, how to speak a new language, how to play piano, how to play the guitar, how to belly dance, etc. It may also not have to do with learning anything at all, but to just go somewhere and do something. Like to go hiking in a certain place or to go to a nearby beach or hot springs. Maybe it means to go to a certain shop that you haven't yet been to or try a certain massage place that a friend has recommended. Whatever it is, identify it and start looking up classes or ways that you can do these things! 5. 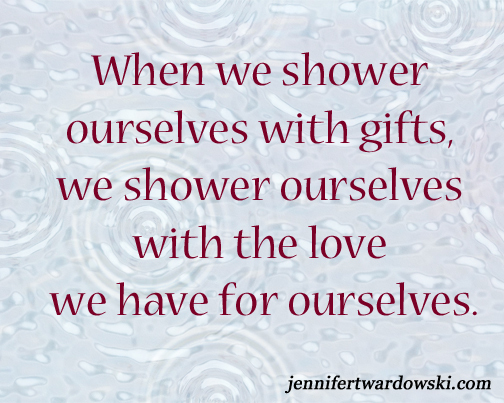 Shower yourself with "gifts." In other words, become a "self-care master." So make yourself a healthy home-cooked meal. Give yourself a relaxing bath filled with epsom salts, essential oils, candles and soothing music. Go on daily walks in nature. Read a book from one of your favorite authors. Buy yourself some of your favorite flowers. Give yourself things that you love and enjoy because you deserve it! When we shower ourselves with gifts, we shower ourselves with the love we have for ourselves. In the comments below, share with me at least one of the things from the list above that you are going to (or at least plan to do) for yourself this week! Jennifer is a self and relationship coach and teacher. She helps women worldwide create fulfilling relationships with both themselves and others so they can live happy and joyful lives. Click here for her Free Self and Relationship Healing Meditation and click here to learn how you can work with her.